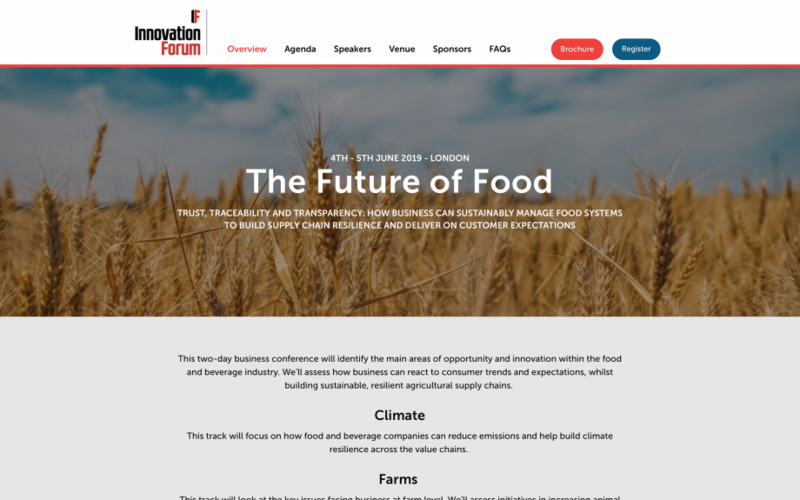 Innovation Forum has just launched a new conference series on The Future of Food, taking place in Chicago (21st-22nd May 2019) and London (4th-5th June 2019). Click here to see more on The Future of Food US. Click here to see more on The Future of Food Europe. These conferences will cover the key issues facing food and beverage companies. From sustainable sourcing and product innovation to consumer trends and communication, we’ll identify how companies can adapt to rapid shifts in demand, expectations and production processes. Educating consumers: How can brands and agri-business partner with advocacy groups more effectively? In addition, we will be running specific sessions within distinct tracks to help focus the conversation: ‘Climate’, ‘Land’, ‘Consumers’,‘Farms’ and ‘Tech and Innovation’. We strongly encourage delegates to join as a team to ensure you don’t miss anything across the tracks. Already confirmed to speak include senior representatives from Unilever, Mondelēz International, Yum! Brands, Ferrero, Kellogg Company, PepsiCo, AB InBev, Nestlé, World Cocoa Foundation, John Deere, Carlsberg, Syngenta, Tyson Foods, General Mills, National Pork Board, IKEA, U.S Farmers and Ranchers Alliance, Chateau Palmer, OSI Group, Mighty Earth, and more. If you would like to join, take advantage of our discounted launch rate (ends next Friday 7th December). Registration details for Europe can be found here and for the US here. Please get in touch for details on group discounts and feel free to share this with any interested colleagues.